Relax girls, it’s a toy. But for the first 1.8 seconds I saw it, I didn’t realize that, and my heart pounded so far out of my chest that it should count for a cardio workout. Episodes like this could be avoided if I were a better pre-laundry pocket checker. But DO YOU KNOW how scary it is to stick your hand blindly into the pocket of jeans worn three days ago by a six-year-old boy? It’s like those Discovery Channel expeditions where someone has to be the first to go down into the unmapped cave, wondering whether they’ll be met by some mythic prehistoric beast. Laundry requires courage, my friends. Courage. Hee hee….Funny you should mention finding things in the DRYER because I found a SHOE last night! Hubby had dumped his clothes in the washing machine and didn’t see the shoe in his basket, I guess? I also picked up a snake like that in my kitchen last night. My daughter has a large collection. seriously. not. okay. i am a self admitted terrible pre-laundry-checker. i have two boys and a girl. 11,6 and 4 in order. 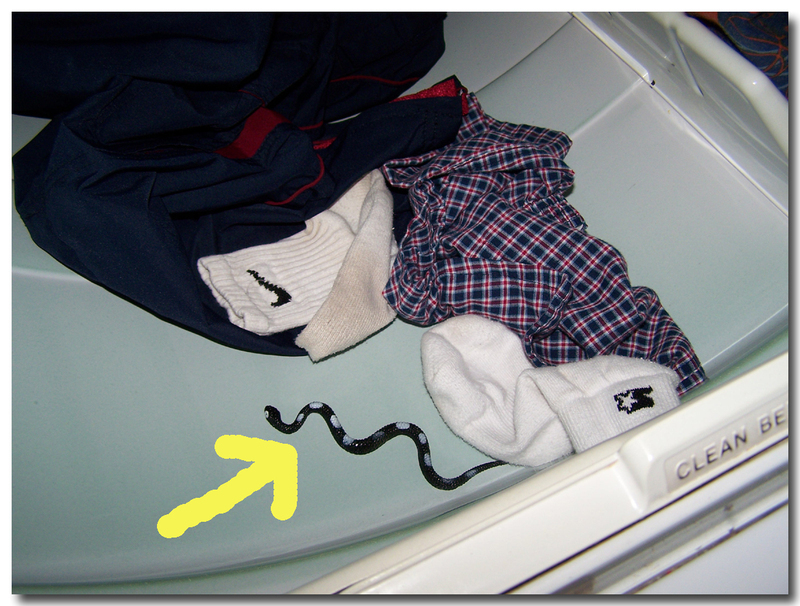 i would need therapy if i found that snake in my dryer. i dread halloween each year, just because i know i will find all the plastic spider rings they got off their cupcakes at the class parties. i know it’s coming each year. i should schedule my therapy now i suppose. Ugh! I know that’s coming for me one day, but for now I’ll just enjoy the blocks I found in my boots this morning! Too funny! I probably would still be lying in the floor (scared stiff) if I would have found that thing in my dryer! I am terrified of snakes! I have had a couple of those go through my dryer too:) You just never know what treasures will turn up…coins, chapstick, dollars (rarely), play phones, pokemon cards…these are just some of the things that have gone through the wash. I refuse to clean out pockets! I have enough to do in my life without you! My favorite part of the picture is the “whites” in with the “darks”…at some point it just really doesn’t matter anymore does it! By the way, I really enjoy your blog, it brings a smile to my face every day. The only thing scarier than finding a snake in the dryer is finding a purple crayon! EEEEEEEEK!! By the way, did you know that a wet dryer sheet will remove melted crayon from the dryer walls? You mean I’m supposed to clean out pockets, too??? speaking of rocks in the dryer, i have them. some child left a whole bunch of pebbles in his pockets. and just as soon as i think i’ve got all of them out, i’ll hear a few more clinking around in there. i think of you every time. ROFL. Love your site!! I, too, have multiple children including one boy and a tomboy. We live out in the country, so there’s no telling what I’ll find in the dryer. You make me smile. I grabbed a handful of dirty towels from the basket to drop into the machine, only to notice that mere INCHES from my had was a TARANTULLA, and most definitely NOT one of the toy variety. I think the scream was heard by those on the Space Station. I now have the boys separate the laundry under my close observation. Not only does laundry take courage, but so does living in TX! LOL…My six year old had a plastic bug in his pocket that fell out when I was pulling it out of the dryer and I did the same thing…. quick panic and then….phew, it’s only fake! I am terrible about checking pockets too before throwing it in the washer! Wow! I am most impressed that the paramedics did not need to be called! That’s funny! My son is one, so I am taking note to remember this! My 6 year old grandson is never without something creepy crawly in his hands or in a pocket…snakes, frogs, bugs. I’m sure my daughter has experienced the same thing at least once or twice. Gotta love those boys! That is too funny, it never stops though sometimes I can’t believe what my husband leaves in his pockets. At the risk of sounding like a cruel mother, I’ll preface this by saying that I do 90% of all the housework in this house including cooking,cleaning, ironing, lawn-mowing, etc. I did teach my kids to do those things so they could be sort of a decent spouse one day, and since they are 20 and 25 maybe within the next 10 years or so, but when they were small I FLATLY REFUSED TO EMPTY POCKETS OR TURN NASTY SOCKS RIGHT SIDE OUT. Not only that, I charged them 25 cents for every time I found something in a pocket or turned a sock around. With their meager pocketbooks, they learned quick to empty their pockets. What started it was a green crayon in the pocket of my 2 year old daughters shorts which got washed AND dried with her pink frilly fluffy bedspread. ‘Nuff said. Late last summer I went into our laundry room to tackle the pile for the day. I opened the cupboard where the laundry soap is kept and screamed so loud that my son upstairs heard me. Sitting on the shelf was a stuffed squirrel. And I don’t mean a cute stuffed animal variety. It was a taxidermied squirrel. You know — the once alive, the someone decided to “preserve” it kind. Creepy. It was left by some “sweet” friends that are in our Bible study and I knew that right away. After I screamed because of fright, I screamed her name! We are in a practical joke war. Don’t worry, we got them back…although after I found a walnut in my coat pocket after church, it may be their turn now…. That is so funny!!! I found a yellow one wrapped up in my six-year old daughter’s coat yesterday. She was trying to scare me because she knows I am TERRIFIED of snakes. Needless to say, I am not a great country girl, but I am learning. Kids are so cute! Lainey got a great laugh out of me jumping six feet high in the air! Last week we found a diaper that had gotten in to the washer…it then exploded due to the amount of water it absorbed. There was all these little gel beads coating the washer and the clothes. Two blessings…the diaper was CLEAN at the time (the toddler had been into the package and distributed them around the house, I didn’t catch the one in the hamper). And my husband came up with the brilliant idea of vacuuming the clothes and the washer out…worked great. I can beat that! Twice in past 6 months, I’ve found a live one in my LR floor. The 1st time, I almost had a heart attack because it was on the move when I saw it. (About same size as the one pictured) The 2nd time, my DH saw it, but I was still NOT happy about it! oh…my…gosh…gross…i would have jumped a mile! I have three boys — I know what you mean about pockets. You just never know what you’ll be sticking your hand into. But I’ve had enough shredded tissues dispersed through the wash that I do check them. I just check the front ones, though (mainly because of tissues) — they’re responsible for the back pockets and the 47 pockets on cargo pants. We most definitely have a “mom doesn’t check pockets” rule. My husband has THE cleanest pocketknife in history. When I first saw that I thought it was real too!! Scary. I’m almost afraid to even check my hubby’s pockets. I might find a frong in it or something. Oh my gosh, I’m laughing so hard I’m going to pee my pants . . . and then I’ll have to stick THOSE in the wash! I know this is totally off topic, but if you have a moment, check out http://www.generouspour.com, a partnership project I’ve been involved with between Clos du Bois and Share Our Strength, working towards ending childhood hunger in America. There are recipes, entertaining tips and music playlists, along with a full on “party kit” with downloadable invitations, menu templates, recipe cards, votive covers and even donation cards in case you’re moved to turn your feast into a charitable fundraiser to benefit Share Our Strength. And . . . when you download a holiday song–either an exclusive remix of Like a Star by Corinne Bailey Rae or another featured song–on the site, Clos du Bois will donate $1 to Share Our Strength. Hope you enjoy! And happy holidays! We’ve got a plastic roach that has been showing up in obscure places around the house. Freaks me out every time. Yeah. I don’t check either. And I’m not gonna. They can make me do the laundry, but they can’t make me check the pockets. And for that, I’ll gladly clean up all those little pieces of washed tissues. I don’t check pockets. The rule here is if it made it into the laundry basket the owner has checked the pockets. I don’t pick up clothes off the floor either. They have to do it and check them. Last year my duaghter washed her cell phone. That was an expensive lesson for her. Now all her pockets are checked everytime! 🙂 Can’t wait to see what kind of treats my son leaves for me when he’s older. My husband started emptying his pockets without prompting after I ran his USB thumb drive through the wash. Oops. Oh my gosh, I would have screamed…. Yup! I didn’t check my son’s pockets either. I was blessed with gooey sticky gum all over my dryer from a stick of gum that had been left in his pocket. That was fun to clean up! Geez…I’d have had a heart attack, too! Are you kidding me? Put my hand in the black hole that is a child’s pocket? I would sooner ruin whatever it contains. It’s best for me not to even try to help my husband do the laundry. My cell phone does not like the whole laundry thing, and I don’t check pockets like he must. Target does not like laundered check cards. Not even if the card is just a little heat-warped. Oh I would lose ten yers off my life if I saw that…. Last night while pulling into the driveway I saw a teeny mouse running alongside the house looking for a way in. Since then, I’ve been paranoid he’s going to come in the dryer vent!!! I’m doing laundry very gingerly today!!! No pocket check rule here either (or turn socks right side out)! Gum through the washer and the dryer seems to be the way my husband likes it! It’s those black, plastic spider rings that get me every time. I don’t know WHY those are such a popular Halloween party favor. this exact thing happened to me a few weeks ago with my oldest son’s plastic spider that he got trick-or-treating. it’s about 2 inches in diameter, so the size alone scared me to death! When my baby brother was about six, Mom put her hand into his jeans pocket and pulled out…. She did get him back… she slipped a live frog into his bathtub later that week, and refused to rescue him until he promised to not put anything in his pockets again, ever. I had four little brothers when I was growing up and laundry was my main chore. So yes ma’am, I do know how terrifying those pockets are. I can’t begin to imagine the things that went through my mother’s washer and dryer because there was just no way I was that brave. It only took one nasty grubworm…..
At my house, that could have been real. I am GLAD you didn’t check the pockets. Can you imagine the coronary you would have had if you pulled out that thing?? LOL! I would have been the same way. I hate snakes. I don’t dare stick my hands in the pockets of pants owned by my boys. Country Boys. Need I say more. It would have been funny if it had been real…it would have been cooked in the dryer! Oh dear god. Yes….6 year old laundry is bad…..but my husband’s laundry is just as bad!! I never know what I’m going to pull out of there! now see, i thought i was scared today by the huge slug i saw in the carport, but that…that takes the cake. i would have screamed like a little school girl! It was better than the deer they cured in my bathtub last year. I think. Well, maybe not. The most annoying thing that gets in my dryer is Chapstick. It never comes out in the wash!! My husband has a habit of leaving it in his pocket, and we all pay the price. When we lived in Houston many years ago, there was a real live rattling timber rattler in the washer. Kind, dear Frank, our next door neighbor, got it our of the washer and dispensed of that creature in the garage. THEN, the kids were playing on the swing set near the woodpile and our dog, Moonshine, barked and barked and herded kids until I went out to check. There was a coral snake nest in the woodpile and the Mama was not happy with all the kids in the yard. Once again, Frank (who worked nights) brought a bucket, caught Mama and all the offspring, and moved the woodpile away from the swing set. I hate to think what would have happened to my then 5 and 2 year olds if Moonshine hadn’t sounded the alarm. He was one good dog! I’m there with you on needing courage for laundry. Although, my husband’s pockets are more dangerous than my 4 year old son’s. Screws, nails, hooks..basically anything that could ruin a washing machine. Oh my!! That would scare me half to death. One time I saw a snake on top of the bushes and went to look at it. My thought was, “oh, it’s just someone’s toy they left here.” And I was about to touch it when it moved and I jumped back! Whew! Thank God I didn’t touch it. That would scrae me too. But not more than the empty bubblegum wrappers that I found in my dryer a few weeks ago. That would be a GREAT episode for that guy on “Dirty Jobs”!!! Check pockets of little boys’ pants before putting them in the washer!!! That’s great. I usually find hot wheels cars in mine. So true – just recently killed hubby’s eye piece for his phone though because I didn’t check well enough all the pockets. Guess I have to change my ways now.